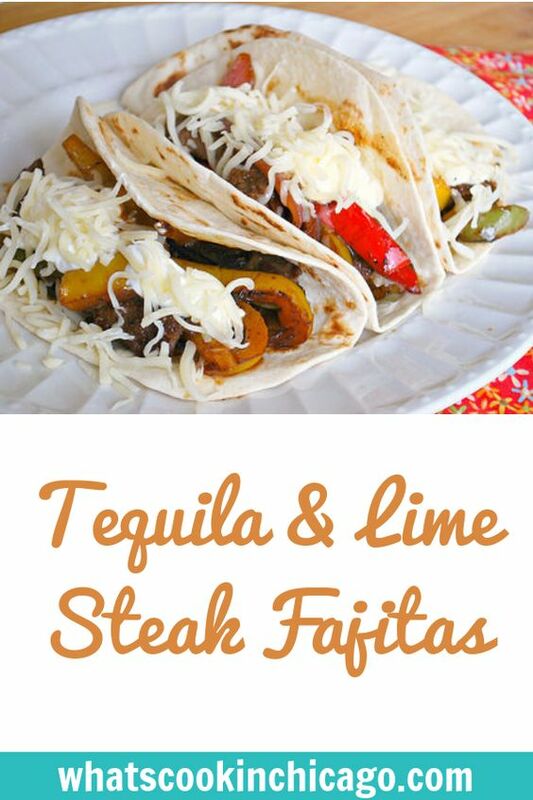 This is a nice spin on the typical fajita recipes I've tried. Using tequila and lime juice really helps tenderizes the flank steak while imparting a bit of flavor. 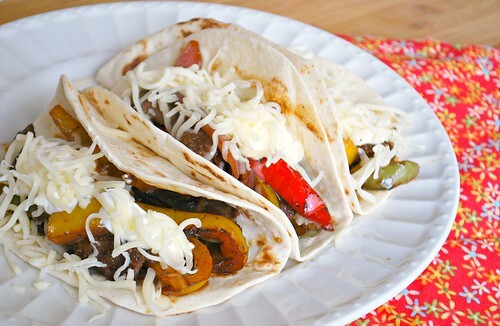 Using a mix of red, yellow and green bell peppers makes it a colorful dish too. You can serve this with your favorite fajita garnishes and toppings, but we especially liked sour cream and chihuahua cheese on ours! In a gallon sized storage bag, combine the lime juice, tequila , chili powder, and garlic. Add the steak strips to the bag, seal and marinate in the refrigerator for at least 1 hour. Remove steak from marinade and discard marinade. In a large non-stick skillet over medium heat, add the oil. When hot, about 2 minutes, add the bell peppers and onion, sauté until tender but slightly crisp, about 4 minutes. Transfer mixture to a bowl and cover with plastic wrap to keep warm. In the now empty skillet, add the remaining 2 tablespoons oil. Saute steak in the sauté pan for about 5 minutes or until cooked through. Add bell pepper mixture to the pan to warm through, and season with salt and pepper to taste. Divide steak amount warmed tortillas and garnish with fresh cilantro, sour cream and/or cheese if using.